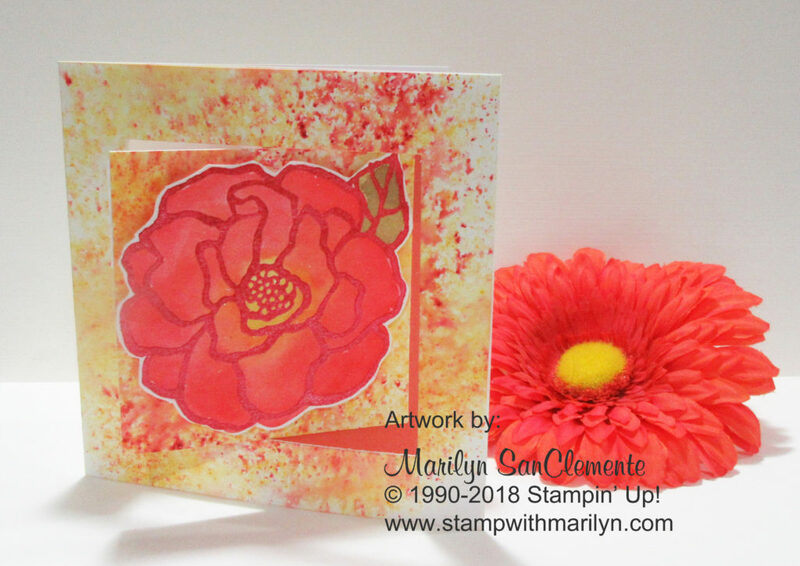 Marilyn SanClemente April 5, 2018 April 5, 2018 All Occasion Card, handmade card, Stampin' Up! 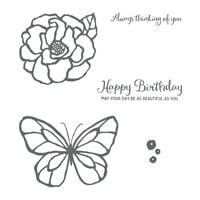 T oday I am sharing a Fancy Fold card that I made for a for the upcoming Stampin’ Up! onStage event! Can you imagine 800 Stampin’ Up! Demonstrators in one room seeing the new catalog for the first time?? Well, that is OnStage this weekend in Hartford! 2 days of fun catching up with other Stampin’ Up! demonstrators, checking out the new catalog, new products and a little training for the next year! This card is 4 1/4″ square. 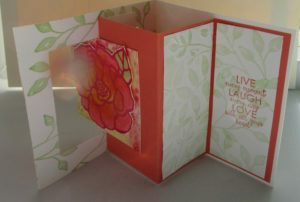 It is actually a smaller version of the card that I posted last week made with the Springtime Foil DSP. Here is the inside for this card. 1. 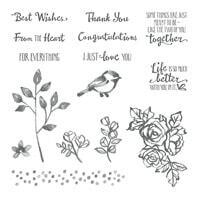 The Card base is a 4 1/4″ x 8 1/2″ piece of whisper white cardstock. Score at 4 1/4″ and fold in half. I love the neat watercolor look that you can get with the Brusho Crystals and thought that would make a good background for the flower from the Beautiful Day stamp set. Sprinkle a little of the yellow, red and orange Brusho Crystals on the front of the card and spritz with water. I use a box lined with paper towels to do my spritzing since the color will run. Set the card base aside to dry. The sample that I have above has a lot of the speckles left from the crystals. 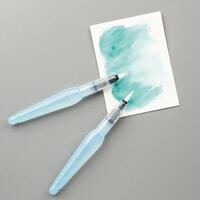 If you want a more watercolor look – you can spritz a little more. 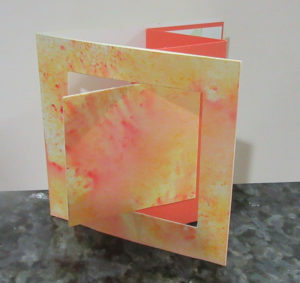 This is another card front that I made that used a little more water which gives a different look without the speckles. 2. 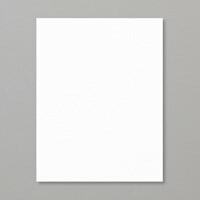 After your card base has dried, I added a 4 1/4″ x 4 1/4″ piece of whisper white cardstock on the inside of the card front. This hides the “drips” from the Brusho crystals. 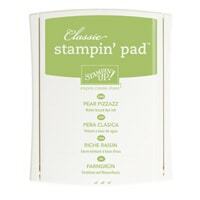 I stamped the leaf with Pear Pizazz ink from the Petal Palette stamp set on this inside piece. 3. 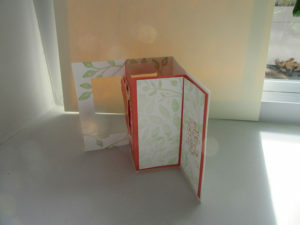 Cut a 1/2″ window on the front side of the card. Line up your paper trimmer at 1/2″. Move your cutting blade to 1/2″ on the top clear ruler of the cutter. Cut up to 3 3/4″. Rotate your piece and make the next cut. Cut each side to make a window. When you are finished you will have a 3 3/4″ square. Trim 1/8″ off two sides of the square. Save this square. You will use it later on. 4. 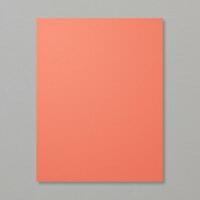 Next cut a piece of Calypso Coral cardstock to 4″ x 5 3/4″. 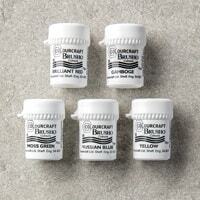 Score this piece at 2 1/8″ and 3 7/8″. Fold into a Z fold. Line up the 4″ side of the Z fold with the right side of the card back. Use Fast Fuse or your adhesive of choice to adhere the last panel to the right side of the card back. Fold the Calypso Coral piece up and line up the square from the window that you cut out. Use adhesive on the right side of the square and attach to the coral piece. It should now move smoothly thru the window on the front of the card. 5. 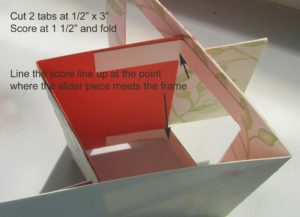 Decorate panels for the sides of the Z fold piece of the card. I used 4″ x 3 3/4″ piece of Whisper white cardstock for each panel. The first panel I embossed with the Layered Leaves embossing folder. I used a brayer and added a little Pear Pizazz ink over the embossed leaves. On the second panel, I stamped the Leaves from the Petal Palette stamp set with Pear Pizazz ink. I then stamped my message with Calypso Coral ink over the leaves. 6. 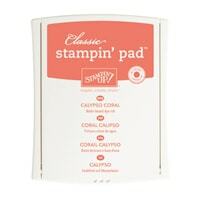 Next I stamped the Rose from the Beautiful Day stamp set on Whisper white cardstock. I used Versamark and Melon Mambo ink and embossed the image with Clear Embossing powder and a Heat tool. I colored the Rose with the Brusho Crystals. To do this, sprinkle a little of the crystal on a clear block and add 2-3 drops of water. Use an aqua painter to paint the flower. I used the Yellow crystals for the center of the flower. 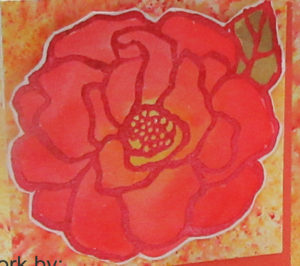 I then added a little bit of orange outside the center of the flower. I then covered this up with red ink from the red crystals. NOTE: I had to practice and play around with the amount of water the get the level of color that I wanted and to do the shading. I used di mensionals to attach the Rose to the front of the card. 7. The last step is to cut 2 1/2″ x 3″ tabs from a scrap of whisper white cardstock. Score the tabs at 1 1/2″ and fold in half. Line up the fold with the point where the Z fold portion of the card meets the frame. Attach with tear and tape or fast fuse. Make sure that you fold up your card and make sure that the pieces line up and the card closes flat. Attach the second tab on the bottom. That’s it! I hope that you liked this card today! Let me know how your project comes out! Enjoy! Thank you to my loyal Customers!